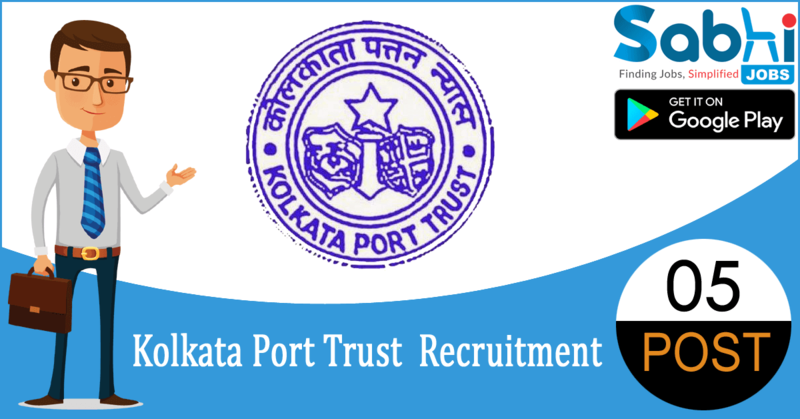 Kolkata Port Trust recruitment 2018-19 notification has been released on official website www.kolkataporttrust.gov.in for the recruitment of 05 vacancies at Kolkata Port Trust. The candidate who is looking for Female Nurse may appear for Walk-in-Interview on 29th July 2018. Qualification Must have passed Madhyamik or equivalent examination OR Must have passed Diploma in General Nursing and Midwifery or B.Sc. Nursing including 06 months of compulsory internship and Must be registered under the State Nursing Council. How to Apply Interested and eligible candidates may appear for Interview along with prescribed application form and one recent passport size photograph and original & self-attested photocopies of relevant certificates/testimonials at the time of Interview. Candidates are requested to register their names at the venue between 10 a.m. to 1:30 p.m. on July 29, 2018. Candidates must appear for the Walk-In-Interview with an application as per the proforma enclosed herewith at Annexure – I, along with one recent passport size photograph and self-certified photocopies of relevant certificates/testimonials. All the original certificates to be shown at the time of Interview for verification. Please note that the Walk-in-interview for the aforesaid engagement will be held on July 29, 2018, at the Office of the Medical Superintendent, Port Hospital, PO-Haldia Township, Dist. Purba Medinipur, Pin-721607, from 10 a.m. to 4 p.m.